Braintree players Erin Grealy (00), Isabella Scarpa (12), Brianna Herlihy and Ashley Russell (10) start the celebration after they defeated Springfield Central. WORCESTER — Saturday marked the end of an era for Braintree. For four years, Ashley Russell, Molly Reagan, and Bridget Herlihy led Braintree’s girls’ basketball team to four Eastern Mass. appearances and two Division 1 state final appearances. “The best part is just the character and the class that they’ve carried themselves with throughout all of that winning,” Braintree coach Kristen McDonnell said. 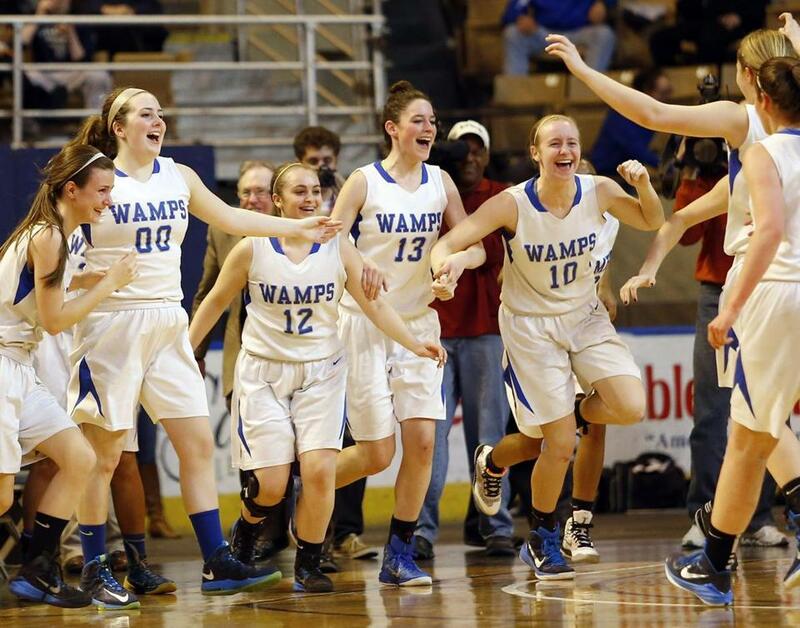 The Wamps’ seniors did not end their high school careers quietly, winning their second consecutive Division 1 state title in a 64-43 rout of Springfield Central at the DCU Center. For McDonnell, the win was bittersweet. Globe photos from Saturday’s state title games. Junior forward Brianna Herlihy scored a team-high 15 points for Braintree (25-0). The game was especially emotional for Brianna Herlihy because it was her final contest with a group of girls she built a friendship with in the third grade. Once the Wamps built a big lead in the first quarter, they never relinquished it. After Reagan scored the first basket of the game, Springfield Central’s Ishanna Jones (8 points) answered with a layup to tie the score at 2. For the next three minutes, it was all Braintree as the Wamps used a 15-0 run to regain the lead. “Once we get going, you know, you always try to throw out the first punch as a team and I think we were able to do that tonight,” McDonnell said. Four different players scored during the run, highlighting Braintree’s unselfishness. Braintree set the tone on the defensive end, limiting Springfield Central (21-6) to just three field goals in the first quarter. “I do think our defense always makes our offense and I felt like that was happening at the beginning for us,” said McDonnell. Braintree took a 43-20 lead into halftime. In addition to Herlihy, Russell added 14 points and Reagan 13. But once Braintree scored its first basket of the second half on a Brianna Herlihy layup, the Wamps never took their foot off the pedal.